Thanks for stopping by. It's pleasant to see you both, although the person lurking behind you does not look very friendly ! Join our Horror Art contest! Submit Entries to chiller31mag@gmail.com. PG-13 Pictures only please! Get a digital copy for only $2.00 !!! Even the most rotted zombies can't wait to get their hands on this!! 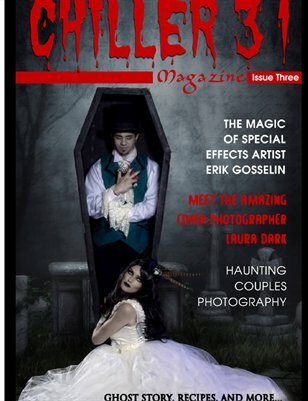 Vampire and Zombie Couple Photography, Recipes and Much More! 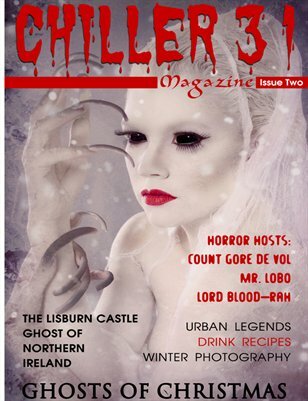 December issue once again includes stunning photography, scary stories, drink of the month and much, much more! Great interviews with Horror Hosts Count de Vol, Lord Blood-Rah and Mr. Lobo. Discover a hidden secret of West Virginia in Roney's Point. Stunning interpretation of the Christmas Carol Ghosts. Love Halloween? Love Horror Films? This magazine combines the best of both worlds! Things that go bump in the night are not just for Halloween anymore! Our premiere issue includes amazing Horror themed Photography and Visual Art. 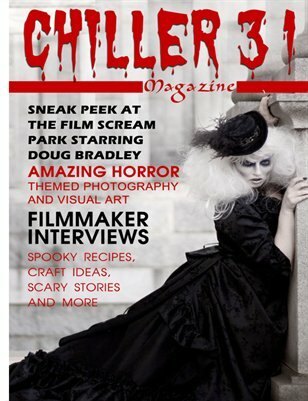 Filmmaker Interviews, Spooky Recipes, Craft Ideas, Scary Stories, Urban Legends and more! Get it at MagCloud or the App Store today!!! What lurks in Madison Ohio Seminary? Can your gut handle Mr. Funny Bones? A truly unique magazine unlike anything you have seen before. Short Stories (ghost, urban legends, paranormal, and horror) Must be under 2000 words. (PG-13 please). Models, Photographers, Makeup and Artist submissions (PG-13 Please) Please provide a high and low resolution picture. Model, Photographer, Artist Release forms can be downloaded at the bottom of this site. Please submit proper form along with your submissions to chiller31mag@gmail.com. Content uploaded will be judged by our editor's panel and will appear in upcoming issues if chosen.